With this rousing call to action, Charles Rangeley-Wilson unveiled the Wild Trout Trust’s original “Guide to Improving Trout Streams” all the way back in 2001. Fittingly, after more than a decade of making trout important again, the Trust has just launched an updated version – “The Wild Trout Survival Guide” – and we’ll study its suggestions in more detail later in this series of articles. But for now, if you’ve been inspired to “put your boots on and make a difference”, what can you do about it yourself? How can you find a river of your own to work on? Let’s start talking about cultural assumptions. Having developed your angling awareness on either side of the North Atlantic within the last 50 years, you’ve probably pondered the well-worn comparison between Big-Sky Modern Egalitarian America, where you’re reliably informed that most of the fishing is free unless it isn’t, and Tiny Little Ancient Britain, where so many people and so much history are crammed into every square inch that none of the fishing is free unless it’s disastrously bad – and even then you’ll probably never find out because it’s hedged about with so many impenetrably feudal rules and regulations. To some extent, I think that’s true. Public interest, as opposed to private property, may even be the reason why truly trout-centric river restoration has been happening in the US since the 1940s, while it only really started here half a century later. But since getting diverted down this ecological sideline myself, I’ve gradually come to realise that the British waterscape isn’t quite as exclusive as you might have been led to believe. On the contrary, our cities and countryside are brimming over with abused and run-down rivers that most people hardly even notice, either because they’re not fishers, or because they’re trying to ignore the scary pollution they assume still lurks in those murky post-industrial depths. The key word, you may already have noticed, is “post-industrial”. Even before the first stirrings of the Industrial Revolution, flowing water anywhere in the British Isles stood a better-than-even chance of being diverted from its natural gravitational course. Wasn’t it free kinetic energy, after all, provided by Providence for the faithful to impound at will, to drive their waterwheels, millstones and labour-saving Spinning Jennies? As we know, steam-power finally took over from most of the old wheelhouses – but water stayed valuable, for making steam and cooling it afterwards, and then for carrying corrosive chemicals and toxic tailings far downstream, out of sight and out of mind. So it’s only since we started evolving our economy into something still slightly uncertain and service-based, with half the population heading for a future of driving tour buses and pretending to be advertising writers, that many of our rivers have started reverting to their proper purpose. It’s a shame we can’t even make our own fly-reels now. But, my friends, this is still what I call an opportunity. Trust me on this first suggestion. Even if you’ve already formulated some very shrewd ideas of where to look for your own river… before you do anything else, buy a map. 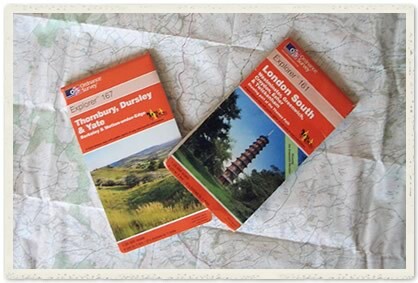 More to the point, if you’re reading this in the British Isles, buy an Ordnance Survey map, with as much detail as you can get. To borrow a phrase from fly-tying, you’ll want to see the elbows, eyeballs and every other anatomical feature of your local landscape. The orange-covered Explorer series, with a whopping 1cm of map to every quarter-kilometre on the ground, is excellent: it’s the sort of wartime hangover we should all be grateful for. On this grand scale, sheet number 161 of the Explorer series shows the Beverley Brook, Brent, Crane, Ember, Hogsmill, Longford, lower Mole, Pool and Ravensbourne rivers, no fewer than 9 other river-systems besides my own post-industrial basket-case snaking across the south-western half of the London basin – any of them worth a good hard look from anyone not already hopelessly overcommitted to Halford’s old playground. On the other hand, the same map also figures every recognisable curve of the Wandle and all those other rivers, right down to my familar dog-leg round the old cress-beds in the middle of Carshalton. I haven’t used it very extensively myself, but if you’re blessed with broadband, you can apparently get even more detail with some sections of Google Earth. Now, when you’ve fixated on some locally riverine topography, get on your bike or start walking. Even among fishers, it’s surprising how many of us overshoot our local patch completely: I’ve done it myself in the past, ignoring perfectly-fishable and restoration-worthy London rivers in my haste to get from Hammersmith to Chertsey, Salisbury and all points south-west. Before long, you’ll have a very good idea of what your area looks like, and you can start narrowing your options down. But if your surroundings look a lot more rural, post-industrial can still be yours. Many northern and western valleys are littered with the bones of old mills, and their leats, ponds and races. Agri-business, national security and privatised water companies have straightened plenty of other rivers into canals, dredged them for defence against floods of stormwater or Nazis, or just sucked the life out of them for profit or irrigation. On the very smallest post-industrial scale, even Daisy the hippy opt-out smallholder’s solitary house-cow is perfectly capable of poaching down the banks of a water-meadow carrier, silting, flattening, and “pounding a trout stream into the bowels of the earth”, as American eco-fisher Ted Williams put it recently. And there’s at least one West Country river I know where a famous fisherman’s famous fishery could probably be resurrected quite easily by a few old-time charcoal-burners coppicing its fringe of trees again… or a few keen fishermen with chainsaws and a healthy disrespect for litigation. On the whole, I reckon it’s probably best to try to find water that’s close to home. You’ll feel the time commitment easier, you’ll have all the satisfaction of taking responsibility for your immediate environment, and as a “local resident” you may also find it easier to cut through some of the inevitable red tape. (And that’s without mentioning what you could be doing for the value of your house). But if you’ve turned over every rock in your area, and haven’t even found a swim to sort out for the local roach and dace – never to be scorned, either, once you’ve spent a summer evening hunting them with a fly-rod and a little Black Gnat – don’t hesitate to travel. Widening your search, by geography or the internet, may turn up treasure. Certainly, some of the Wandle Trust’s most committed and valuable support comes from well north of the Thames, and there’s even a large contingent of commuters from far Stoke Newington. Eventually, they’ll be able to take their experience and re-apply it to the new Olympic sites of the East End… so everyone stands to learn and benefit. What’s more, although it’s great fun to adopt a stretch of water and start transforming it with your own initiative and strong right arm, that’s not compulsory either. Hooking up with another organisation can sometimes be much more strategic (Rich and I did it ourselves, here on the Wandle), and you may be able to attain a usefully critical mass much faster. In practice, that organisation could even be your fishing club. Many associations and syndicates now seem to be noticing the economics of the wild trout argument, even if they haven’t been famous for their C&R sustainability in the past. If your own club runs your local water, so much the better: talk to the right person, and you could easily find out about several beats that need improvement, upkeep or tender loving care. Don’t forget, it’s just as important to maintain and evolve work that’s been done in the past, as to start new projects – I know for a fact that both the Charfield and the Salisbury & District Angling Club are actively recruiting volunteers for just this sort of work, right now. To conclude this month’s thoughts, I’ll make a contentious suggestion. As a fisher, you’ll already have a haunting suspicion that not everybody loves the Brotherhood of the Angle, and that some of those who love us least should actually be our allies. (Maybe it’s fear, or squeamishness, or simple everyday ignorance – but we all remember how one of those led Anakin directly to the Dark Side). So, whether or not there’s obvious river work to be done, in any of the combinations I’ve suggested so far, you may also find it’s worth joining the friends of a local nature reserve, wetland trust or other non-specifically-fishing eco-group. Healthy water is healthy water, you’ll certainly learn something new, and you may well find yourself changing a few attitudes among people who’d never even thought you were human, if they thought about you at all. In a world where trout are threatened, and we all need to give something back, isn’t that what part of our sport could be about?